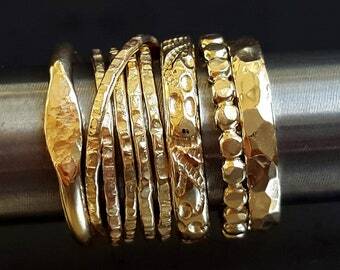 Six stackable bands handcrafted in yellow gold filled. 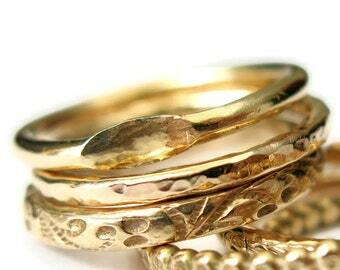 An assortment of vintage style floral, beaded, and lightly hammered bands. Two of each design, 15mm total width. 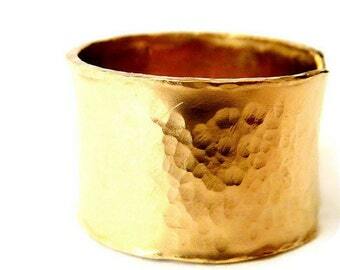 Organically shaped, with outside texture, modern, urban look rings. 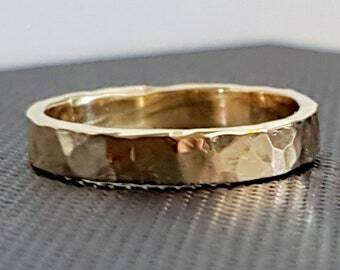 Each ring has its unique form, looking beautiful individually or stacked together with other rings. Very pretty set! Have been wearing them for ages now and still looking just as (or more) beautiful! Contacted by seller to try to remedy a solution to my problem. That is greatly appreciated. 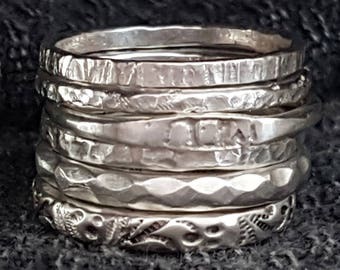 I order 2 different silver rings to used them in different fingers, same seller. Both are beautiful, classy, perfect. Very happy with the rings and specially the seller. Great packaging. Payments accepted through PayPal, It is easy, safe and quick. Your credit/debit card will be charged, by Etsy 's regulation, when the order is placed. No need to hold a PayPal account. PROCESSING TIME is 1 - 3 weeks from the payment day. If possible, due to the work volume, will ship earlier than scheduled. Please check each listing for updated processing and shipping time. In case the item is needed earlier, please send a message BEFORE placing the order. 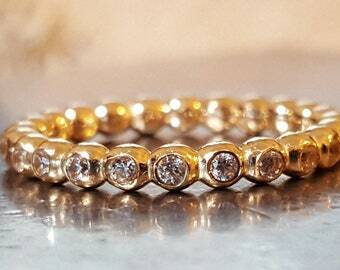 Items involving stone setting, engraving, plating, request 3-4 additional days. LOCAL customers will be charged 17% V.A.T. for orders delivered within Israel. Due to the made-to-order handcrafted nature of work, no returns or exchanges accepted. Please contact me if there is an issue with the order/ item purchased so I can find the best solution. In case of a claim concerning quality/ producing mistake, please send a message + picture attached, within 24 hours of delivery. When approved for return, the item must ship within three days, in the original condition, shipping fees refunded by the shop. In case of returns, refused delivery, not claimed, when the item received back, a refund will be provided, less shipping and 25 % restocking fees. For International orders, all taxes, duties, and customs fees are the responsibility of the customer. Any tax and duty information presented at checkout are estimates for informational purposes only. Actual tax and duty are during delivery if applicable. Your local post office or carrier can give you information on the methods of payment accepted for the duties, taxes, and other fees collected upon delivery. Your order is shipped well protected in a padded envelope and aesthetic presentable wrapping. DHL Express: Estimated transit time 2 - 3 business days depending on geographic location. INTERNATIONAL customers are responsible for their country taxes and duties. Please do proper research before placing the order. In case of returns, refused delivery, not claimed package, if the item received back, a refund will be provided, less shipping fees and 25 % restocking fees. Tracking provided when order shipped. International Air Mail without tracking visibility, not insured. Estimated transit time 2 - 6 weeks, depending on geographic location. Each piece is unique. There might be slight variations between one piece to the other. 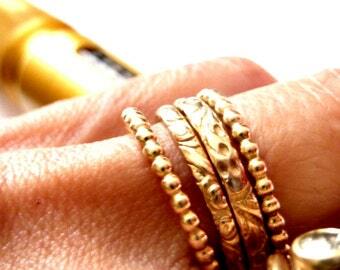 These are the attributes of handcrafted jewelry. Pictures were taken in close-up to show the details and do not indicate the size or scale. Please carefully read the detailed listing description and use measurement ruler. Colors may appear different on your screen due to individual screen settings. Silver Oxidation with liver of sulfur. The original silver color underneath will begin to show where the item comes in contact with the skin. This is true of all oxidized jewelry. It is not a permanent color but a patina that will change in time. Green finger effect: a mark on the finger could be a chemical reaction to lotions, humidity, Ph acidity, or a copper/ brass allergy. Some people do react to the alloy. Usually, it does not affect people, but some are more sensitive to it. Measure when fingers are at room temperature. If you hesitate between two sizes, always go with the larger one. 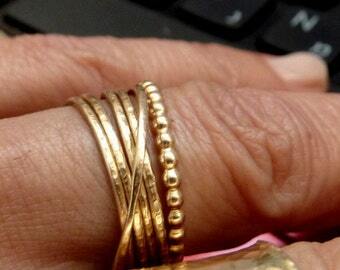 Wide bands need a bigger ring size, for comfort’s sake. Use a paper strip about 1/2 inch wide, not a string. If your knuckle is a lot larger than the base of your finger, measure both and select a size in between the two. 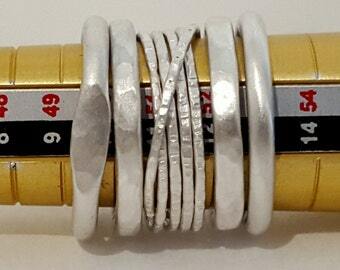 FOR BEST RESULTS a specialized jewelry shop will find the correct size. Care for your jewelry: use a drop of dish soap or baking soda powder mixed with cold water. With your fingers rub gently, rinse under plenty of cold water, dry with a soft cloth.